You Are The Worst Triumph Owner And I Don't Like You. 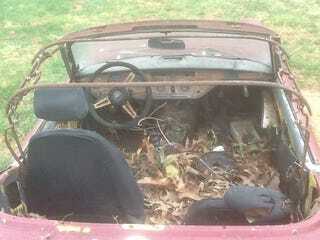 This poor little ‘74 Triumph is for sale on cl and definitely has that new car smell after all these years... Or maybe that is the smell of mold, rust, dead leaves, squirrel poo, ect. etc. Apparently it turns over... Yeah... Sure it does. It’s “been sitting a long time” according to the owner... Or at least the seller, as this car has no title. To the owner: You should be ashamed of yourself. Have you even heard of a tarp? Damn.